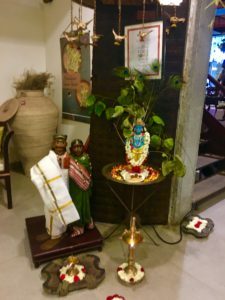 Mahamudra is an all vegetarian restaurant, boutique, and artworks shop located in Mylapore, Chennai. When Raj and I visited Chennai in August 2016, we had lunch with family at Mahamudra. It’s run by Isha Yoga Foundation, and prides itself on healthy food made from organic and locally grown produce. The decor is simple and artistic. The food, at least on the day we went, was buffet style, and had some local flair to it. Especially a drink that was flavored with an herb called vettiver. I was so excited about this, but was a bit disappointed with the flavor and the consistency of it. It could have been more authentic and refreshing. 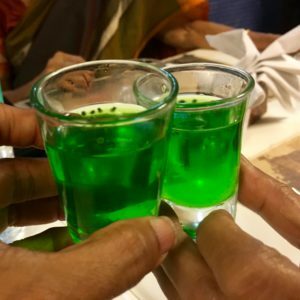 The rest of the menu was what you would find in a South Indian home on any given day. 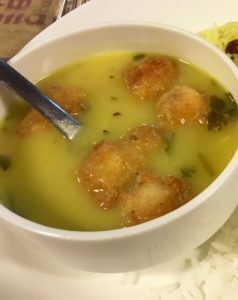 Sambar, more kuzhambu (yogurt based dish, similar to kadhi), a couple of vegetable dishes, bonda/vada, dhal (lentil), a few desserts. It’s good for vegetarians and caters simple food that tastes like your mom could have made it. Very Colorful and Creative Website ! Wishing you great success, Srilatha, in all your endeavors.